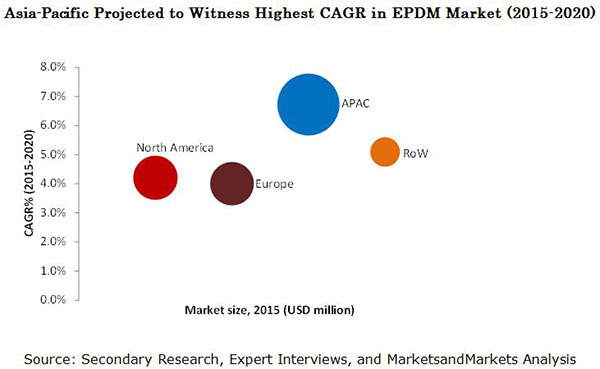 [185 Pages Report] The global EPDM market is projected to be worth USD 7.2 Billion by 2020, registering a CAGR of 5.4% between 2015 and 2020. In this study, 2013 has been considered as the historical year and 2014 as the base year for estimating market size of EPDM. The report aims at estimating the market size and future growth potential of EPDM market across different end-use industry such as automotive, building & construction, plastic modification, lubricant additive, wires & cables, and tyres & tubes and region. The market size is forecasted from 2015 to 2020. In the secondary research process, different sources have been referred to identify and collect information for this study. These secondary sources include annual reports, press releases, and investor presentations of companies, white papers, and certified publications, articles from recognized authors. 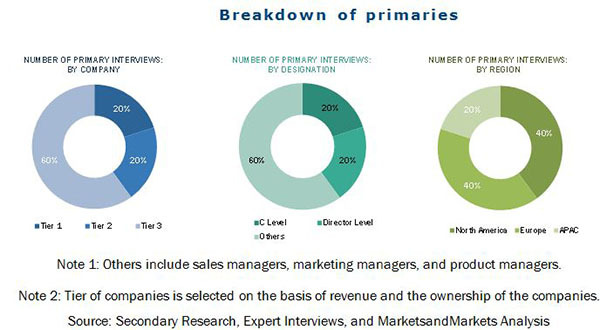 In the primary research process, industry personnel from both supply and demand sides have been interviewed to obtain qualitative and quantitative information for this report. The bottom-up approach has been used to estimate market size of EPDM end-use industry, and regions, in terms of value and volume. The top-down approach has been implemented to validate the EPDM market size, in terms of value and volume. With the data triangulation procedure and validation of data through primaries, the exact values of the overall parent market size and individual market sizes have been determined and confirmed in this study. Below is the figure showing break-up of profile of primary discussion participants. This study answers several questions for the stakeholders, primarily which market segments to focus in next two to five years for prioritizing the efforts and investments. These stakeholders include EPDM manufacturers such as the ExxonMobil Chemical Company (U.S.), PetroChina Co. Ltd (China), SK Global Chemical Co. Ltd (South Korea), Mitsui Chemicals Inc. (Japan), Carlisle Companies Inc. (U.S.), DoW Elastomers (U.S.), John Manville Inc. (U.S.), JSR Corporation (Japan), Lanxess AG (Germany) and Kumho Polychem Co. Ltd (South Korea), among others. Government organizations and universities such as Cambridge University (U.K.), European Union, and the U.S. EPA are also the critical stakeholders for this study. Each application is further described in detail in the report with value and volume forecasts till 2020. Each region is further segmented by key countries such as U.S. Canada, Mexico, China, Taiwan, Japan, South Korea, India, Malaysia, Germany, France, the U.K., Spain, Italy, Turkey, Brazil and Argentina. The global EPDM market size, in terms of value, is projected to reach USD 7.2 Billion by 2020, at a CAGR of 5.4% between 2015 and 2020. The increase usage of EPDM in plastic modification applications, increasing domestic consumption in China, and continuous expansion activities undertaken by companies are key factors driving the growth of the global market. The lubricant additive is projected to be the fastest-growing application segment of EPDM market between 2015 and 2020 owing to the fact that it is an indispensable feature of all machinery, ranging from applications which enable the manipulation of very small parts to the movement of very heavy masses. EPDM is used as a viscosity improver (VI) in lubricants. Its propensity to absorb oil makes it advantageous to be used in oil viscosity improving applications. The automotive industry is the largest-growing end-use industry segment in the global EPDM market. The consumption of EPDM in the automotive industry globally is mainly due to its high heat and weather resistance, and vibration absorbing properties. It is because of these properties that EPDM is also used in various applications such as hoses, mechanical goods for under-hood applications, body sealing, weather-stripping, belts, engine mounts, brake parts, windshield wipers, etc. Currently, Asia-Pacific is the largest market for EPDM, accounting for around forty percent of the global market size, by value and volume, in 2014. Among all the countries, China dominates the market in 2014, closely followed by U.S. Malaysia is the fastest-growing market in the world and is expected to surpass China and Japan in the EPDM market in the near future. Along with the rising demand of EPDM in the Asia-Pacific region, international EPDM manufacturing companies find it reasonable to manufacture EPDM products in the Asia-Pacific region than other regions due to the lower cost of labor. Though the EPDM market is growing at a significant growth rate, few factors hinder the growth of the market globally. Increasing environmental concerns regarding the emission of VOCs during the production of EPDM is one of the major restrictions for the growth in market. Also, the shift of end-user market from developed countries to the developing countries, and fluctuations in the currency exchange rates of Japan are the major restraints toward the growth of the EPDM market. Companies such as ExxonMobil Chemical Company (U.S.), PetroChina Co. Ltd (China), SK Global Chemical Co. Ltd (South Korea), Mitsui Chemicals Inc. (Japan), Carlisle Companies Inc. (U.S.), DoW Elastomers (U.S.), John Manville Inc. (U.S.), JSR Corporation (Japan), Lanxess AG (Germany) and Kumho Polychem Co. Ltd (South Korea), are the dominant market players in the global EPDM market. The diverse product portfolio and strategically positioned R&D centers, continuous adoption of development strategies, and technological advancements are the few factors that are responsible for strengthening the market position of these companies in the market. 10.5 SK Global Chemical Co. Ltd.
10.11 Kumho Polychem Co. Ltd.
10.15 Sumitomo Chemical Co. Ltd. Figure 63 SWOT Analysis: Petrochina Co. Ltd. Figure 68 SWOT Analysis: SK Global Company Co. Ltd. Figure 70 SWOT Analysis: Mitsui Chemicals Inc.